Bits or pieces? : Pioneers, Town Planners and those missing Settlers. Pioneers, Town Planners and those missing Settlers. All business activities evolve, they share a fairly common lifecycle described in the following diagram. From innovation, to custom built examples, to productisation (including the appearance of rental services) and finally to commodity (including utility services). deviates from what has existed before and is a novel practice. is dynamic and constantly changing. is rare and poorly understood. has high levels of uncertainty and it is not possible to predict future outcomes. has no market data, competitor analysis or well understood trends. has characteristics which emerge as we learn about it. is strongly affected by serendipity, chance encounters and discovery. 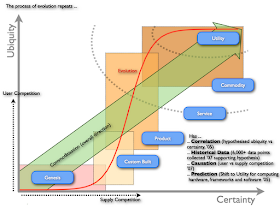 is a potential source of future worth, differential and hence competitive advantage. is mature and rarely changes. is standardised with a wealth of best practice. is commonplace and well understood. has a high degree of certainty and known impacts. has an abundance of market data, competitor analysis and trends are well known. has well defined procedures and plans for implementation. is a cost of doing business with little or no differential advantage except through operational efficiencies. Now all businesses consist of a mass of activities, each of which may be at different stages of their lifecycle (stage of evolution). You can map a single business by examining the components involved in a line of business and their stage of lifecycle. You can also examine broader effects by plotting the frequency of activities at different stages of lifecycle thereby creating a profile for an organisation or an industry. This is shown in the figure below, to which the chaotic, linear and in-between stage of transition has been added. 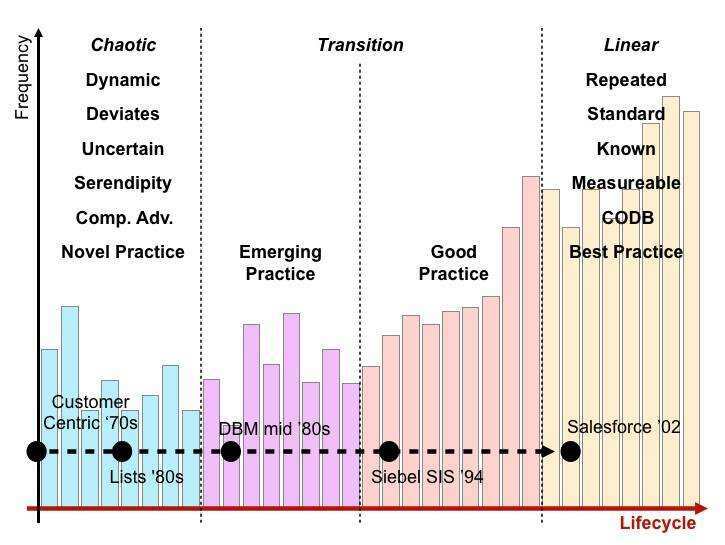 The techniques which you use to manage each of the phases of profile (chaotic, transition, linear) are entirely different because the fundamental characteristics are different. Which is why no one size fits all approach to management exists. 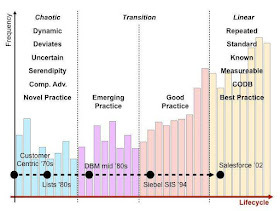 For example, agile development approaches are ideal for the innovation (chaotic) and early transition phases but are superseded by more structured approaches such as six sigma in the late transition and commodity (linear) stages. You can't apply one size fits all without either hampering innovation or impacting efficiency. You need multiple techniques, multiple types of people and even multiple cultures. Alas we ignore it. In many areas of management, this creates a constant yo-yo between one extreme approach and another such as : agile vs six sigma, networked vs hierarchical, push vs pull. The answer is invariably you need a balance of both. The trick is to learn when to use each. 1. Since lifecycle is constant and the properties of activities change as they evolve through their lifecycle, why do we organise ourselves around type of activities (e.g. IT, Finance, Operations) especially as a "typed" approach leads to outsourcing of inappropriate activities, misapplied techniques & alignment issues between groups? 2. Why don't we organise ourselves instead by lifecycle with specialist groups managing each stage of lifecyle regardless of the type i.e. an organisation based upon Pioneers, Settlers and Town Planners? 3. Most companies have Research & Development groups (equivalent to Pioneers) and common or shared service groups (equivalent to Town Planners) but Settlers seem to be invisible. Why is this? 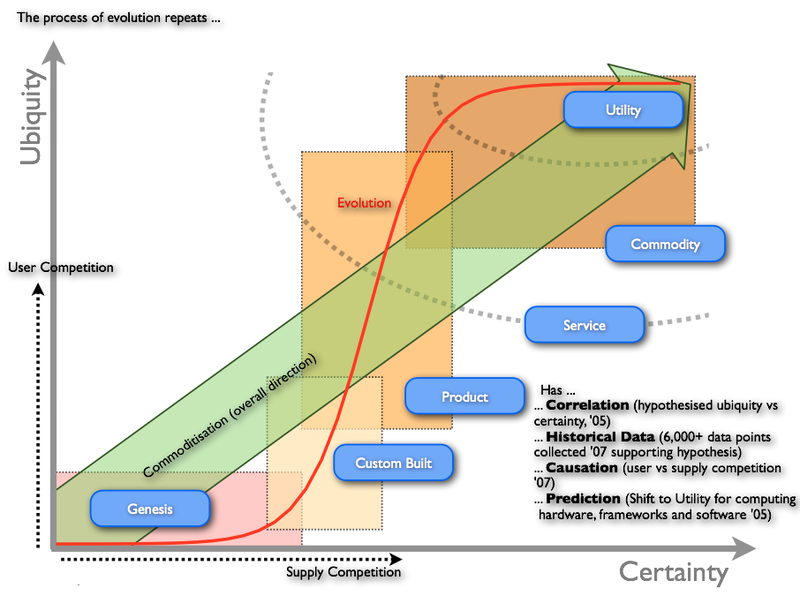 Who manages the transition from innovation to commodity in your organisation? A bit of digging in the old memory banks, brings me to Robert X. Cringely's book, Accidental Empires reissued in 1996, page 235 - 238. Copying some quotes from that book (which I recommend people go buy and read), the ideas of pioneers, settlers and town planners are all there. I knew it had come from somewhere. Think of the growth of a company as a military operation, which isn't a stretch, given that both enterprises involve strategy, tactics, supply line, communication, alliances and manpower. Whether invading countries or markets, the first wave of troops to see battle are the commandos. Commando's parachute behind enemy lines or quietly crawl ashore at night. Speed is what commandos live for. They work hard, fast, and cheap, though often with a low level of professionalism, which is okay, too, because professionalism is expensive. Their job is to do lots of damage with surprise and teamwork, establishing a beachhead before the enemy is even aware they exist. They make creativity a destructive art. [Referring to software business] But what they build, while it may look like a product and work like a product, usually isn't a product because it still has bugs and major failings that are beneath the notice of commando types. Or maybe it works fine but can't be produced profitably without extensive redesign. Commandos are useless for this type of work. They get bored. It's easy to dismiss the commandos. After all, most of business and warfare is conventional. But without commandos you'd never get on the beach at all. Grouping offshore as the commandos do their work is the second wave of soldiers, the infantry. These are the people who hit the beach en masse an slog out the early victory, building the start given by the commandos. The second wave troops take the prototype, test it, refine it, make it manufacturable, write the manuals, market it, and ideally produce a profit. Because there are so many more of these soldiers and their duties are so varied, they require and infrastructure of rules and procedures for getting things done - all the stuff that commandos hate. For just this reason, soldiers of the second wave, while they can work with the first wave, generally don't trust them, though the commands don't even notice this fact, since by this time they are bored and already looking for the door. While the commandos make success possible, it's the infantry that makes success happen. What happens then is that the commandos and the infantry advance into new territories, performing their same jobs again. There is still a need for a military presence in the territory. These third wave troops hate change. They aren't troops at all but police. They want to fuel growth not by planning more invasions and landing on more beaches but by adding people and building economies and empires of scale. Robert X. Cringely, Accidental Empires, 1996 (the reissued, I don't own the original). I owe Robert Cringely a debt of thanks and hence the update. These days I use terms such as uncharted to describe the more chaotic and industrialised to describe the more linear. Nice information provided by you regarding urban planning. According to my opinion, urban planning is the organization of all elements of a town or other urban environment. However, when one thinks about all the elements that make up a town. Thanks for sharing.